You are here: Home > Widgets > Show Top Labels Only In Labels Widget. Show Top Labels Only In Labels Widget. As you write more and more posts you will keep adding labels to them to categorize your posts. You can add more than one label to any single post. Labels are useful as they serve as keywords channelling traffic to your posts through search engines like Technorati. To limit the number of labels shown in your Labels sidebar widget login at Blogger.com and click 'Layout' link on Dashboard. The Page Elements subtab of Template tab will open. If you do not have a Labels widget in the sidebar Add a Labels Page Element to it. After the Labels widget is added click on Edit Html subtab of Template tab. This will open the Template code box on the Edit Html subtab. Click the Expand Widgets Template checkbox on top of the Template code box to put a check mark in it. The Template code box will show the expanded widgets templates. Preview. Save Template. Clear Cache. View Blog. In the screenshot at right you can see two label widgets. The Modified Labels widget at the top shows only the top two most frequently applied labels. The Normal Labels widget at the bottom shows all the labels in the blog. If you have such a widget and lots of labels it can get terribly long making your blog stand on it's long sidebar!! Change '100' in the above line to the number of posts you wish to load. Remember that if you select a higher number the page will take too long to load and you may lose traffic. Thanks for your many great hints: I appreciate your work a lot. As you can see the Modified Labels widget contains only the top two labels while the Normal Labels widget contains ALL the labels. Hi, I tried this, and all my labels disappera. I have an inordinate amount of labels, so the ideal number for me is labels with 5 or more posts. I tried replicating exactly what you have here, as well as increasing the number to 05, but either ways, all the labels disappear. Check the label code again. Increase number starting from 1. Clear cache after each save. Add a separate label widget with the modified code. Is there a way to set up a list of lables to appear in a widget. I am looking to "subdivide" my labels into different groups. Is this possible in any way, even to hard code them each into their own lists. I am not sure how I would do that. how to make buttons (design) for items like homepage. I want to put labels like I want but it goes alphabetically. any help. If there is more suggestions to make my webpage more beautiful kindly suggest me. You can add label links in a Html Page element formatted any way you want. hi...can i add label if i using classic template..if can, please advise...thanks..
Clearing out the cache is essential to solving problems, but I didn't have any, so I didn't bother. It worked the first time. In searching for this solution I cam across others who had the same desire. Hope you don't mind if I pass this gem along. My labels widget has no html tab. For the Label collapsible boxes see How to Classify Blogger Labels. You can try to Add a Background Picture in the Header CSS. Would be possible to show only the first n labels after having them alphabetically sorted? Of what use would it be to the viewer to see this? For example one of the top labels in this blog is 'Template'. 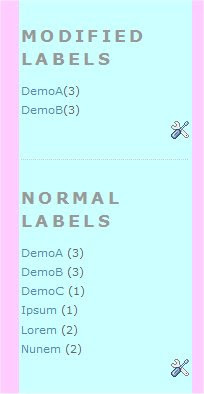 If I were to show only first two alphabetically sorted labels, this label would not show on the blog and there would be loss of traffic!! Since only a few label links will be shown in the list why not create it manually by pastig your top alphabetical label links in a Link List Page Element. This worked like a champ! Thanks. My list was ridiculously long -- I was ready to drop it. This solved the problem. Thanks so much...this worked like a charm. But can you reduce the font on your webpage? In Firefox, it looks like it is 36 pt! At the bottom of every post add a heading "Category" and then add your label-link. Then Publish post. At the bottom type 'Category'. Highlight the above word using left click an drag with mouse. Click the Bold icon in tool bar. After the word 'Category' type in Label name. Highlight the label name usig mouse. Click Add Link icon in toolbar. Replace the CAPS in above link with actuals of your blog. Ok, I see what you mean. I didn't expect something as simple as this! ahah! It's an option but I actually want the category to appear just beside the author and timestamp (which lie just under the post title), not in the post text. I understand it might be a bit complicated so don't bother with this if you don't feel like it! Really appreciate your help! Keep it up! Thank you! When I uncheck the Labels option in Blog Posts widget, they don't disappear from my blog!?!? How come? Did you clear cache after saving changes? Yup, cleared cache... doesn't change anything! I'm puzzled! I tried this widget and it works! If you re-title your "Labels" widget (I tried to rename mine the more common, "Tags"), you will need to change the widget code to reflect the new title. Hello how can i add a menu bar in my blog. Have a look at How to Add CSS Navigation Tabs to Blog?